On February 14, 2018, 16-year-old Annagrace Myers was sitting in a classroom at Marjory Stoneman Douglas High School. In the middle of her chemistry class, the fire alarm went off. She didn’t know it then, but that was the moment her entire community was changed forever. The sophomore survived what is now known as one of the deadliest school shootings in the country’s history. 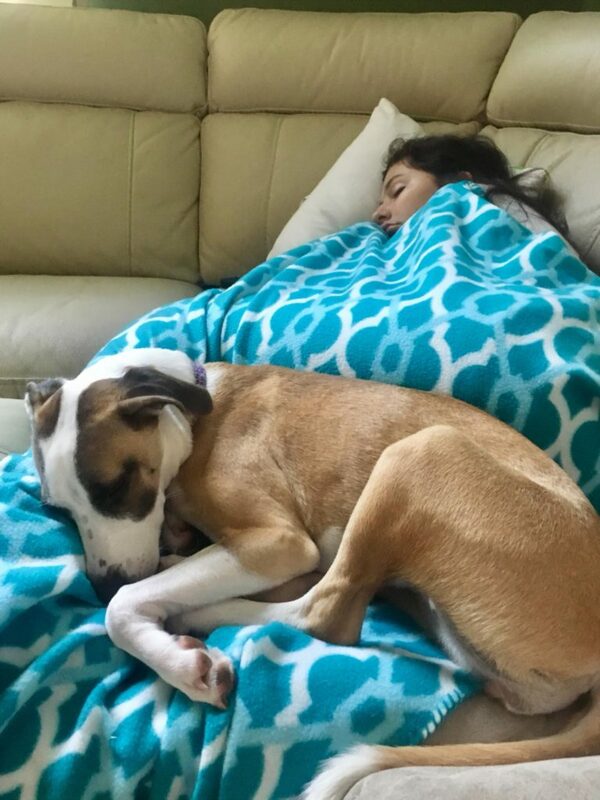 Recovering from the traumatic event hasn’t been easy, but Annagrace has a special friend, a rescue dog named Auggie, to help her heal. The gunman that took aim at Annagrace’s school took 17 lives and injured 17 others. Annagrace’s cross country coach was shot and killed while opening his door to fleeing students, and her brother came home from college after hearing about the death of a close friend. For days, Annagrace didn’t feel safe enough to leave her house. She stayed inside crying and struggling to cope. She was part of a city in mourning, and getting back to “normal” seemed impossible. To help students cope with feelings of grief, fear, anger, and guilt at surviving, the school brought in a special group of reinforcements. As classes resumed, they welcomed several therapy dogs, and even a therapy pig, to interact with students and teachers. The animals were there to provide comfort, confidence, and love. After weeks of tears, Annagrace felt a special connection with the therapy dogs. She felt that with their help, she might someday move on from her experience. While the school’s therapy dogs helped Annagrace heal, she could’t stop thinking about how much she wanted a dog of her own. She’d asked her parents for a dog before the shooting happened, and after experiencing the special kind of care only dogs can provide, she wanted to adopt more than ever. Annagrace’s parents didn’t need much convincing. They knew their daughter had always wanted a dog, and they also saw how the therapy dogs helped her emotional well-being. They decided to go for it, and they visited Justin Bartlett Animal Rescue ready to expand their family. Annagrace and her family met a litter of puppies with a rough start to life. Their mom was brought to the shelter and given only a few days to live. She was weak and struggling to care for her pups, but there was one pup in particular that was determined to help her mama fight. The puppy’s name was August, and out of all her siblings, her foster mom said she was the most protective. She brought her mom food and was always there to provide comfort. When the mama dog gradually gained strength, her foster said it was all because of August. There was something special about August’s personality that made her stand out from the litter. Annagrace recognized it right away. She knew August was exactly what she needed, and now the two share an incredible bond. With Auggie by her side, Annagrace feels safe. Her friendship with her dog has helped her cope with surviving a horrific event and helps give her the confidence she needs to walk into school everyday. Auggie sleeps with her and snuggles every chance she gets. When Annagrace wakes up from terrifying nightmares, Auggie is always there. She’s her true friend, and she’s had a hand in healing the entire Myers family. They saved her from the shelter, and now she’s more than happy to return the favor. As part of the Petco Foundation’s annual Holiday Wishes campaign, Auggie and Annagrace have been awarded a $100,000 grant to go toward the lifesaving efforts being made at the shelter Auggie was adopted from. Justin Bartlett Animal Rescue will use the money to connect even more rescue dogs with the people who need them most. 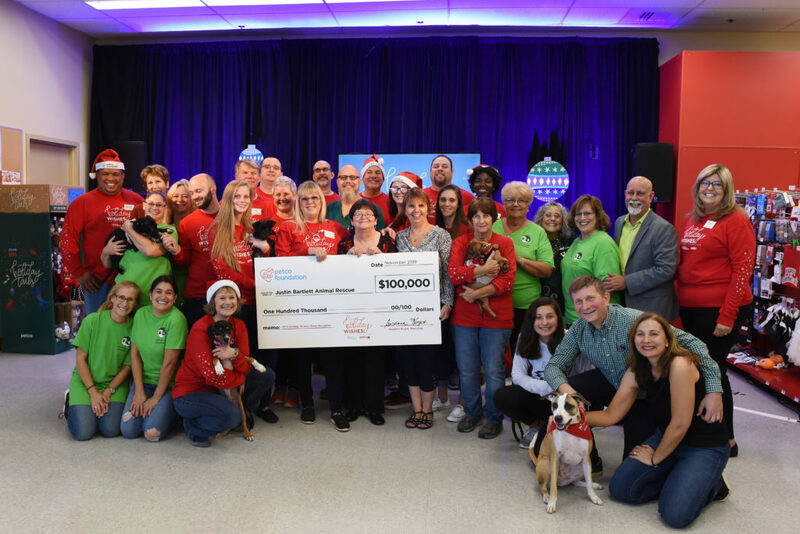 Along with Auggie’s substantial grant, Petco Foundation also awarded 50 other animal welfare organizations with grant money. Adopters from all over the country submitted stories about how their rescue dogs changed their lives, and 51 were chosen to have their holiday wishes granted. Now that the grants have been passed out, Petco Foundation is offering even more opportunities to earn money for local shelters. From now until December 19, animal lovers are encouraged to vote for the “People’s Choice Award” by picking their favorite Holiday Wishes story. The top five organizations will have the chance to receive additional funding from $5,000 to $25,000. Visit the Petco Foundation website to start reading heartwarming stories and help make a deserving shelter’s holiday wish come true.